The Centa Group’s turnkey solutions for fire protection and prevention in warehousing and storage facilities, include fire system selection, design layout, installation and maintenance services, which are custom-designed to suit specific environments and exact requirements. “The challenges of protecting warehouses from fire can be complex, depending on the fire load of the warehousing facility, coupled with the fire risk of goods stored in the building,” explains Duncan Boyes, chairman of the Centa Group, specialists in fire protection. “Although a sprinkler system is often considered sufficient to protect a warehouse and its contents, other supplementary fire systems, including electronic fire detection and suppression systems are necessary. Passive Fire Protection (PFP) like fire doors and retardants, grease ducts, fire stops and closures, as well as specialised cable coatings, also form an integral part of fire protection and safety in warehousing. “Centa’s team of technical experts – with extensive knowledge about fire and the legal requirements of fire protection equipment – is committed to provide dependable fire protection systems that will adequately protect people’s lives and property, in the event of a fire. Fire systems to consider for warehousing and storage facilities include electronic fire detection systems, which are smoke detection devices, that give an early warning of an impending fire hazard. Centa supplies two types of fire detection systems – addressable systems, which are recommended for large installations and conventional systems for smaller buildings, where zones can be easily identified. Addressable systems consist of a series of fire detectors and devices connected to a main control panel. Each device has a location, so if a fire starts, the detector that is triggered quickly identifies the source of the fire. A conventional system differentiates between zones and in the event of a fire, this system indicates where the fire source is, in a particular zone. Gas suppression systems are automatic fire extinguishing systems that utilise inert gases and chemical agents to control and extinguish a fire, without human intervention. Automatic Pro Fire units are available from 1, 5 kg to 9,0 kg, while Centa ceiling powder/gas units, with a working pressure of 1500 kPa, range from 1 kg to 9 kg. Centa’s water fire fighting systems for warehousing applications include fire sprinkler and water reticulation systems. The fire sprinkler system, designed to prevent a fire from spreading, is an automatic fire protection measure, consisting of a water supply system that provides adequate pressure and flow rate to a water distribution piping system. Sprinklers are installed at ceiling level and are connected to a reliable water source. The system automatically activates when the heat from a fire causes a glass component in the sprinkler head to fail, thereby releasing water. A water reticulation ring mains, used in conjunction with hose reels and hydrants, plays an important role in limiting fire risk. PFP systems are installed in warehouse and storage areas to contain a fire and to slow down the spread of flames from the point of ignition. It is critical these systems comply with quality and safety specifications. 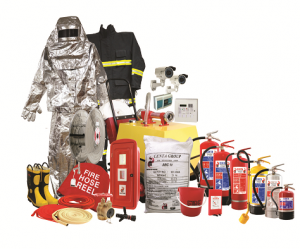 Centa’s extensive range of specialised fire extinguishers is designed for efficient performance and absolute reliability in the event of a warehouse fire. D Class fire extinguishers use Sodium Chloride as the medium to extinguish metallic fires that burn at higher temperatures; high performance water additive HW and HP units are durable in arduous conditions and HS corrosion protected fire extinguishers, are suitable for use in coastal areas, the mines and sulphar plants. Centa also manufactures HV fire extinguishers recommended for transport vehicles used for loading and unloading goods into and out of warehouse facilities. Inilam A – a highly effective water additive material, with excellent properties for combating rubber tyre, engine and fuel type fires – is used in the manufacture of these robust vehicle fire extinguishers. A specialised fracturenating dispersion nozzle, designed for optimum fire fighting efficiency, ensures an accurate and effective distribution of the extinguishing medium, as well as easy operation. A range of environmentally friendly, fluorine free foams can be applied to hydrocarbon and polar solvent fires. The Centa Group, which was established over 20 years ago, is the only fire company in South Africa to locally manufacture a range of fire extinguishers and hose reels – all with the ‘Proudly SA’ stamp of approval. This attribute is enhanced by accreditation from various standards authorities, including SABS and ISO 9001: 2015 certification, SAQCC-Fire. Suggested caption The Centa Group’s turnkey solutions for fire protection and prevention in warehousing and storage facilities, include fire system selection, design layout, installation and maintenance services, which are custom-designed to suit specific environments and exact requirements.